You are here: Home / Farm to Fork / Make Your Own Delicious Homemade Root Beer! Today I’m going to share a quick homemade root beer recipe with you! Making homemade root beer was one of my favorite things to do as a kid. Every Halloween my mom would make homemade root beer and I loved the cool fog that it created! I love making my own homemade root beer! This recipe is fun for kids because the dry ice used in the root beer creates “fog” that is perfect for Halloween. Your kids will love the root beer and the fog that this recipe creates! This recipe is fun for Halloween parties, barbecues, or just making it for your kids! Disclaimer here: Obviously, you don’t want to let your kids handle or be anywhere near dry ice. Dry ice can be dangerous, so this recipe definitely requires adult supervision! Make sure you wear gloves and handle the dry ice safely. Also keep in mind that you should buy the dry ice right before you plan to use it because it can evaporate pretty quickly if you don’t store it correctly! Mix the water, sugar, and root beer extract together in the container. Carefully add in your pieces of dry ice and stir. At this point the dry ice will start to dissolve and create “fog.” Stir the mixture frequently so that the dry ice doesn’t stick to the sides or bottoms of the container. Serve once all of the dry ice has dissolved! Trust me, your kids will love the fog and the yummy root beer! It’s perfect for Halloween (or any time of the year!) 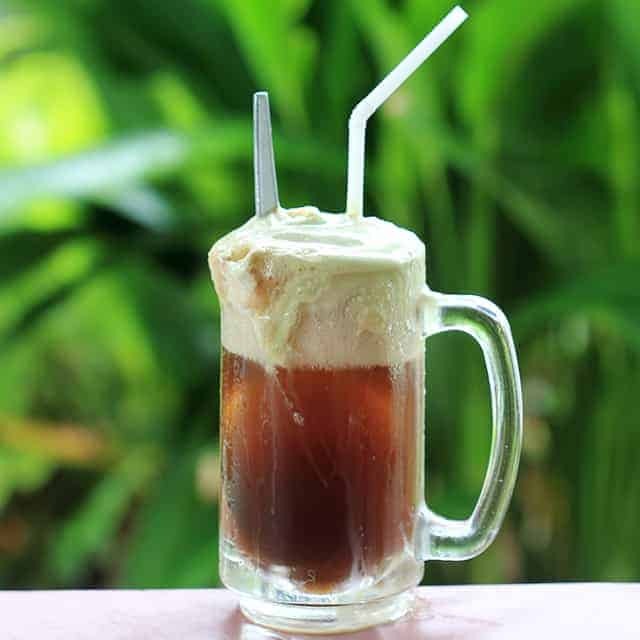 I also love using this recipe for making root beer floats! **Same as with the sugar, you can add more root beer extract or less depending on your taste preference. Personally, I would start with two tablespoons and then slowly add more if you feel it needs it. ***The more dry ice you put in to this recipe, the longer it will bubble and create fog! But that also means that you will have to wait longer before you can drink it. Mix the water, sugar, and root beer extract together a container (I always use a large pitcher). Carefully add in your pieces of dry ice and stir. The dry ice will start creating “fog” as it dissolves! Stir the mixture frequently so that the dry ice doesn’t stick to the sides of the container. Serve once all of the dry ice has dissolved! Remember to make this recipe in a well ventilated area and never put a cover on the container you’re making it in! Covering it can cause the pressure to build up inside of the container which can cause it to explode. Always handle dry ice safely by using thick gloves or tongs. Dry ice can burn your skin if you aren’t careful. I’m just wondering…does the dry ice gives the root beer carbonation? Carbon dioxide really can burn you.